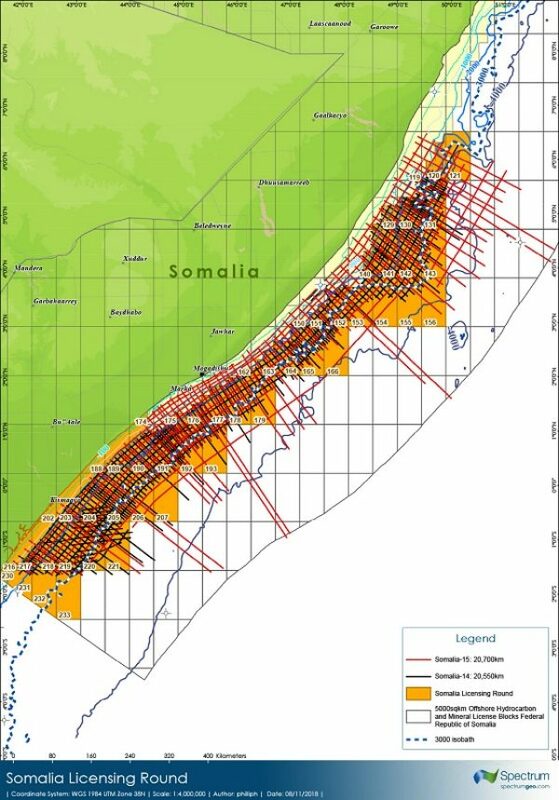 LONDON – Somalia is inviting bids for 15 blocks across various basins under the country’s 2019 offshore licensing round. Delegates from the country’s Federal Ministry of Petroleum and Mineral Resources outlined the terms in London last week at an event organized by Spectrum Geo. The presentation was the first of its type ever staged outside Somalia. According to head of the Ministry Abdirashid Mohamed Ahmed, the licensing round was first announced in Cape Town last November, and it had been a long process administering the resources to get to this point. “In recent years the Ministry and government have been working together to put together proposals,” he said. Spectrum acquired and processed the 2D seismic data-sets over the offshore areas offered. The results, according to Eng. Karar Shukri Doomey, director general at the Ministry, suggest Somalia’s offshore hydrocarbon resources could be the largest anywhere in East Africa, or even across Africa as a whole. July 11, 2019 will be the final date for companies wishing to apply for qualification for bidding, he added, with the Ministry set to qualify potential operators and non-operators on Aug. 29. Would-be operators must demonstrate drilling experience beyond 500 m (1,640 ft) water depth. Bids must be received by Nov. 7 and signing of production-sharing agreements (PSAs) should follow a month later, involving three initial exploration phases lasting up to eight years. The PSAs should take effect on Jan. 1, 2020. Dr Pedro van Meurs, a consultant to Ministry who helped draw up the fiscal regime, said the team involved had examined recent experiences of other countries around the world pitching offshore exploration rounds. In cases where the offshore exploration leads to discovery and subsequent development of a larger field, and assuming that the oil price is higher and costs are lower, the government take will be greater. Royalties on gas finds will be lower than for oil, in recognition of the difficulties East Africa is facing in monetizing gas as LNG, he added. And unlike most other African nations the state will not have a carried interest in the first round exploration licenses, so this should help keep costs down, he suggested. Selection was based on analysis of 20,185 km (12,542 mi) of 2D long-offset seismic data over water depths of 30-4,000 m (98-13,123 ft) that Spectrum acquired and processed following a co-operation agreement with the government, complemented by 20,500 km (12,738 mi) of existing 2D data from 2014. The survey was designed to allow for seismic coverage over the shelf, slope and basin floor with dip, strike and recording time intervals suitable for defining a range of leads and prospects. Streamer lengths of 10,050 m (32,972 ft) were used to record information at all offsets, and to assist imaging of the underlying syn–rift geometries. In addition, Spectrum Geo applied modern processing algorithms to the data to optimize imaging of steeply-dipping extensional and compressional features and illumination of amplitude anomalies. The final pre-stack depth and time migration (PSDM and PSTM) products are available to bidders. Analysis of the area over the northern offshore blocks had revealed six different source rocks that could be generating hydrocarbons, said Spectrum’s geoscience director Karyna Rodriguez. Work with Leeds University in northern England suggests potential for large oil fields in an extensive Jurassic carbonate build-up, she added. Over the southern area, there are also indications of a Late Cretaceous carbonate complex, “and this too looks like it could be an oil province,” she said, with potential for 2-3 Bbbl finds. Data from US Geological Survey images revealing evidence of oil slicks on the sea surface appears to support this idea.